Hematite is the most important iron ore on earth and is often used to discharge other stones. 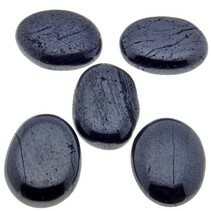 These small hematite stones are often used to discharge other stones from negative energy. Place the (gem)stone 24 hours between the hematite stones to fully discharge. The hematite is often placed in a glass bowl or a shell. Hematite can be rinsed under water, but should be dried well because it contains iron.